Old-World Tracker Organ Being Installed in Winnetka! 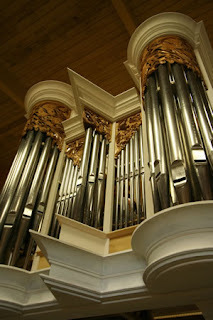 Organ craftsman, Martin Pasi of Seattle, Washington (http://www.pasiorgans.com), and his team of artisans have been busy for the past few weeks installing a tracker organ (the organ of choice in many European cathedrals) at Winnetka Congregational Church (http://www.wcc-joinus.org). The product of an extensive inquiry and fund-raising effort at WCC, stretching back almost seven years, the project is nearing completion. The instrument, identified as Pasi's "Opus 18," will be installed and playable by mid-October, 2007, after which the extensive "voicing" of the instrument will continue for several months. The sanctuary has also been renewed and refreshed as part of the project and the overall project includes an "outreach" component. The impressive instrument sports 3,500 pipes, ranging in size from 32 feet to the size of a pinkie! All are welcome to come and enjoy a memorable worship experience, enhanced by this fine instrument.